The Loop Leader's display provides multiple ways to help users understand and keep track of their processes. 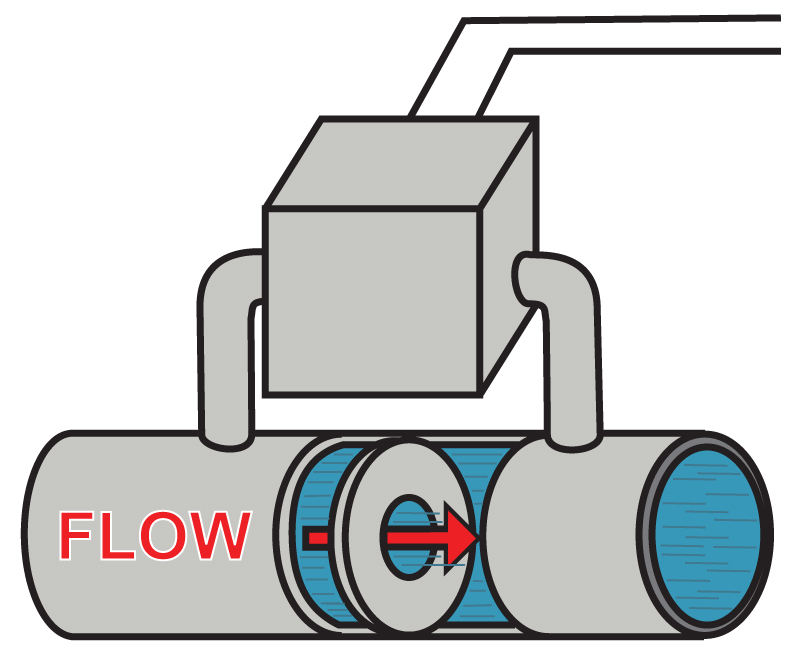 The most obvious is the dual line which typically allows the user to display both flow rate and total at the same time. There is also a bargraph that includes a numeric value of the percentage the bargraph represents. Finally, to alert users to an alarm condition, the display can turn red and flash an alarm message. One of the key features of the Loop Leader Flow Rate/Totalizers is their ability to display flow rate and total at the same time. In addition, the meter can toggle between the rate and total and their corresponding units. 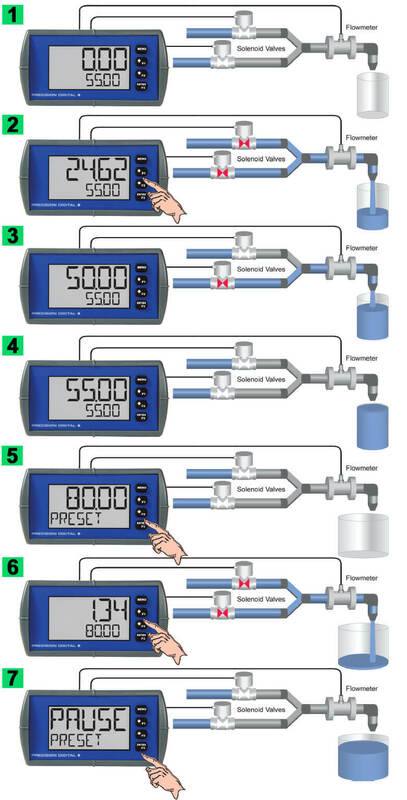 In addition to the most common setup of flow rate on the top line and flow total on the bottom line, these meters can be set up for a variety of display configurations. To help users get a quick understanding of where their process is at, certain Loop Leader models are available with a 20-segment bargraph. This bargraph also includes a numeric value of the percentage the bargraph represents. 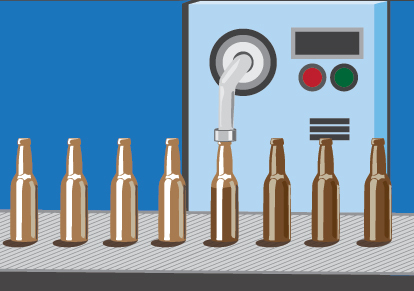 The bargraph can be programmed to represent either the rate or total or it can be disabled. When an alarm occurs, the Loop Leader's display can be programmed to turn red and flash an alarm message along with the process variable and an alarm indicator (!). (Alarm indicator symbols are not available on bargraph models) The Loop Leader's flashing red alarm message can be activated even if no relay or open collector is connected. It is possible to change the display units within the selected unit class without the need to re-scale the meter. When selecting a new unit from within the DISPLAY menu (e.g. 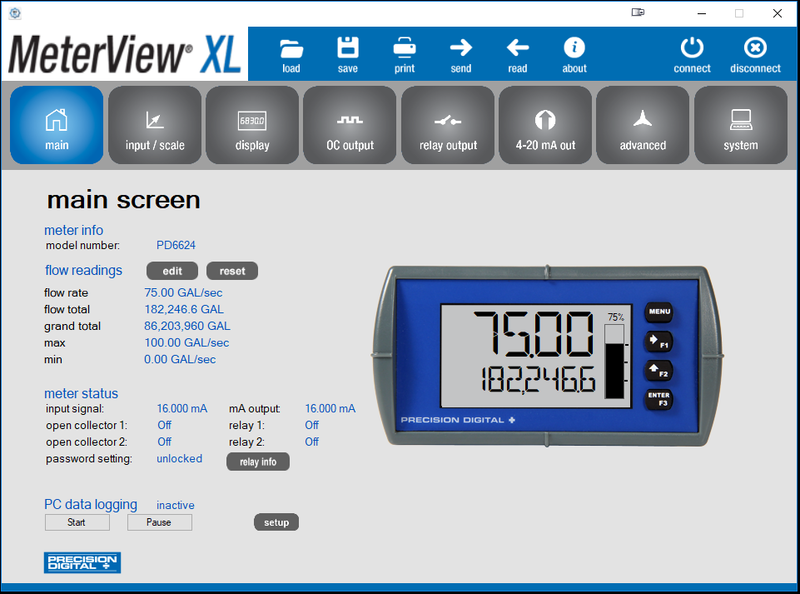 changing from gallons (GAL) to liters (L)), the meter will automatically convert the display values to display the new unit. If entering a custom unit (CUSTM), a custom conversion factor will need to be entered. 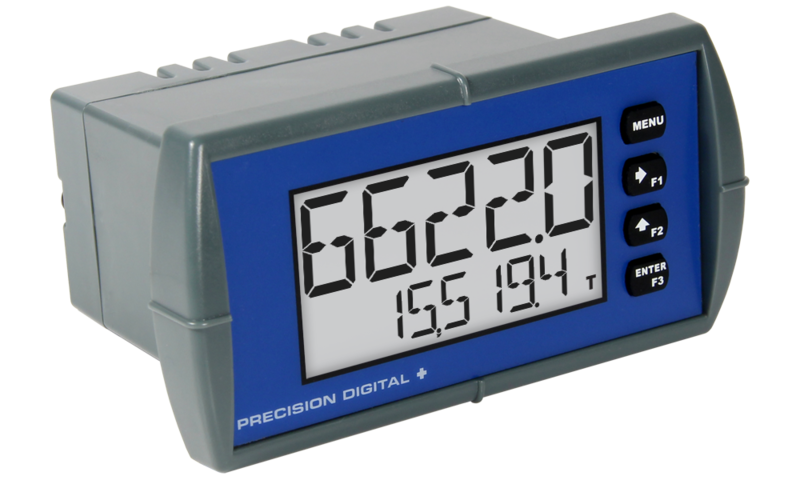 The meter has six available preprogrammed unit classes, volume, height, temperature, pressure, weight, and rate. When the desired unit class or unit of measure within a class is not available, a custom unit may be programmed by using the (CUSTOM) menu. Display momentarily by pressing the F1 key (default) or assigning to any of the other function keys or to the digital input in the User menu. Press Enter to lock/unlock max/min display. Display continuously by assigning either display line to max/min through the Display menu. Any of the F1-F3 function keys (buttons) and the digital input can be programmed to reset the max & min readings. Users can use the Loop Leader's dual-scale feature when they want to show the same input in two different scales. For instance, an application where the Loop Leader displays the input in gallons per minute and cubic feet per minute. Loop Leaders are available with two open collector outputs as standard and two solid state relays and 4-20 mA output as options. The open collector outputs and relays generally operate in the same manner, with the major exception being the open collectors are not available for batch control or sampling and the relays are not available with pulse features. The open collectors and relays can be controlled either automatically or manually. The alarm status (with flashing red message) will show on the display even with no output wired. 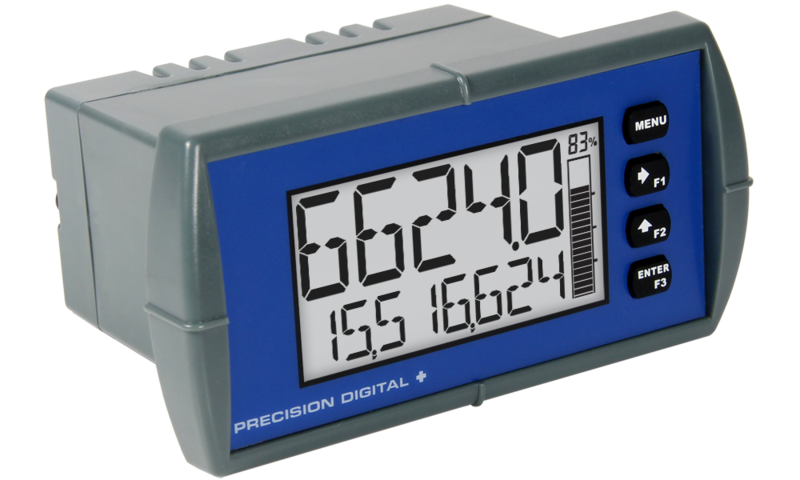 The Loop Leader is equipped with two NPN open collector outputs that may be set up for pulse outputs, alarms, timed pulses, stopwatch on/off, or disabled. Pulse outputs can be set to transmit the rate, total or grand total. Output 2 may be used to generate a quadrature output based on the other open collector output. An output test mode is also selectable to generate pulses at a constant programmable frequency. The open collectors are commonly used to generate a pulse for every user-defined amount of flow that has been generated. For instance, the Loop Leader can be programmed to generate a pulse for every 100 gallons of flow. The meter is optionally equipped with two solid state relays that may be set up for alarms, timer, stopwatch on/off, sample or batch control. The relays are rated at 250 VAC/DC @ 1 A for resistive loads and 75 VA @ 0.6 A, 250 VAC/DC max (Safe Area only) for inductive loads. Alarms are available based on the rate, total, grand total, or digital input. A relay set to sample will trigger when the total or grand total value has incremented by a programmed amount. The relay can be programmed to stay on for a specified amount of time. For example: if a relay is set to sample the total with a COUNT of 1,000 and a TIME of 10 seconds, the relay will energize for 10 seconds each time the total increments by 1,000 (e.g. 1000, 2000, 3000). The isolated analog output signal can be configured to represent the rate, total or to retransmit the 4-20 mA signal input without the need to scale the output. While the output is nominally 4-20 mA, the signal will accurately accommodate under- and over-ranges from 1 to 23 mA. The output can be reverse scaled such that the meter’s high calibration value outputs 4 mA and the meter’s low calibration outputs 20 mA. Automatic (AUTO): Alarm will reset automatically once the alarm condition has cleared. Automatic/Manual (AUTO.MAN): Alarm will reset automatically once the alarm condition has cleared but can also be reset using the Enter button (or whichever function key is set to acknowledge) at any time. Latching (LATCH): Alarm must be reset manually and can be done so at any time. Press the Enter (ACK) button at any time to clear the alarm. Latching with Reset after Cleared (L-CLEAR): Alarm must be reset manually and can only be done so after the alarm condition has cleared. Press the Enter (ACK) button after the alarm condition has cleared to reset the alarm. Loop Leader flow rate/totalizers can be programmed for a wide variety of totalizer applications. They can display total, grand total, or non-resettable grand total; the rate can be displayed with a time base of seconds, minutes, hours or days. The user can program a totalizer conversion factor, a non-resettable grand total, password protection, and several total reset methods. In 13-digit mode, the bottom line shows the least significant digits and the top line shows the most significant digits. The meter is not capable of displaying commas on the top line, so this number is actually 1,211,230,379. The comas can be removed from bottom if desired. See sample on bottom, right. The user can enter a totalizer conversion factor that allows the meter to display total in different units than the rate. 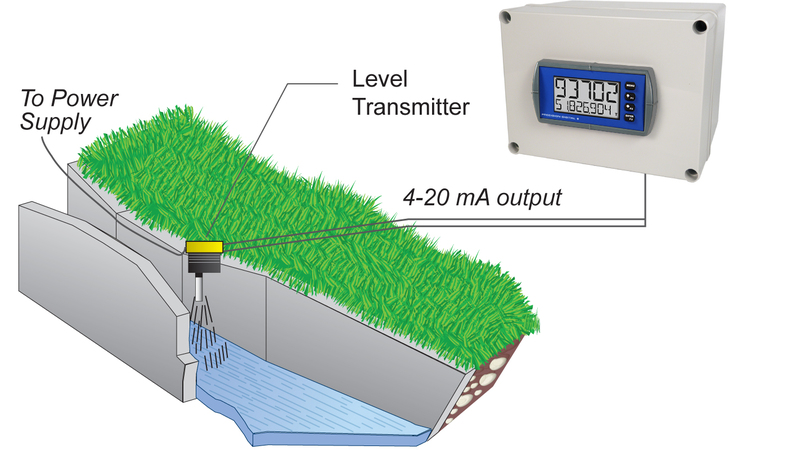 For instance, a customer could measure flow rate in gallons per minute and total in hundredths of acre-feet. A multiplier may be selected to automatically display the value in kGAL, MGAL, etc. The total and grand total can be password protected so they can be reset only by authorized personnel. The user can set up the grand total to be non-resettable by selecting YES for PERMLOCK in the Advanced - Grand Total - Reset menu. Once this is done, the grand total can never be reset. The total can be reset via an external contact closure on the digital input. The three front panel function keys can be programmed to reset the total and grand total. This makes it possible for the user to reset either the total or the grand total by pressing the appropriate function key. Of course, if the total or grand total is password protected, they will not reset when the function key is pressed unless the password is entered. The user may program the meter for a low-flow cutoff such that the meter displays zero below this point, regardless of the input value. The Loop Leader’s two relays can be set up to alarm when the total reaches a user-defined set point. A variety of reset modes are available and the user can also program time delays and fail-safe operation. All versions of these instruments are CE marked. The hazardous area versions of these instruments are UL and C-UL Listed as intrinsically safe and nonincendive and ATEX and IECEx Certified for Intrinsic Safety in Hazardous Areas (Gas Atmospheres). These versions are also UL and C-UL Listed under the UL 61010-1 General Safety Standard. One of the most useful aspects of the hazardous area approvals is that these instruments are approved by UL as nonincendive so they can be installed in Division 2 areas with no additional protective devices needed. Display: Dual-line LCD with backlight. Both lines 14-segment alphanumeric. Top: 0.7" (17.8 mm), Bottom: 0.4" (10.2 mm). Display may be programmed to turn red and flash a user-defined message on alarm condition. Configuration Files: Generate with or without meter connected. Save to file for later use. USB Power Connection: Meter is powered by USB connection during programming. Are you looking for enclosures that are compatible with this meter?